First formed in the early 1970s, the Lakeside Central Railway has operated both passenger and freight trains throughout its history. In its early years, the Railway supplemented certain commuter operations for �fallen flag� railroads in the Northeast, including the Reading Railroad, with these operations based in Philadelphia and its suburbs. The late 1970s also saw the Lakeside Central establish long distance passenger service, including a cross county route originating in New York City and going through the country's heartland, terminating in Los Angeles. This passenger train, named The City of Little Rock, operated for several years, until continued operations became financially impractical. The Lakeside Central also for a time in the late 1970s and early 1980s operated both local passenger and connecting freight service based in the state of Kansas, and also turbo train passenger service known as The Caterpillar. Beginning in 1980, and continuing from that point to the present, the Lakeside Central has been at the forefront of the provision of high quality passenger rail service on a regional basis, centered in and around Florida and Georgia. Its daily regional passenger service links Atlanta and central Georgia to Orlando, Jacksonville to Miami, and Pensacola to Jacksonville, thus providing the only current passenger service in North Florida, and the quickest service linking North and South Florida. There are four exciting new premium passenger service routes recently implimented. The first is The Nighthawk, which links Atlanta and Chicago, thus providing a key �missing link� for long distance train travel from Florida and the Southeast to Chicago, there connecting with Amtrak. The next is the Lakeside Central's new cross-country service, the Southern Continental, from Orlando to Los Angeles, again, designed to fill a need for high quality timely comfortable passenger service. A third service has been introduced, or reintroduced, bringing back The City of Little Rock with premium service between Orlando and Phoenix, passing through its namesake city. And the latest service, The Magic City (heading south) and The Windy City (heading north) will provide for a limited seasonal schedule between Miami and Chicago to serve vacationers looking to escape the cold of the Great Lakes reagion. An exciting facet of this last service is the use of new high-speed rail equipment similar to that used by the Acela trains on the Northeast Corridor by Amtrak. The similarity is only skin deep, however, as these new trains are outfitted with the premier refinements expected with Lakeside Central Railway passenger service. These trains harken back to a time when the rails were the country's primary and premier form of transportation. The Lakeside Central prides itself on providing a reason for people to choose to ride the rails. Premium and First Class services are available on its long distance trains. While its operations are centered on passenger service, the Lakeside Central continues freight operations in selected markets and regions. * - An imaginary land cruise between Orlando and Anaheim running weekly or as needed. 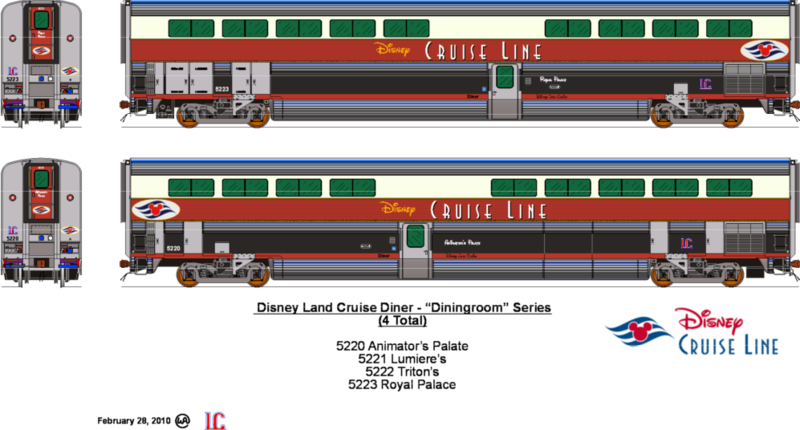 This service was first concieved as a connector between Disneyland in California and Walt Disney World in Florida, then as a connector between both US parks and both US ports of call for the Disney Cruise Line. This is the high-end First Class service noted above in the Corporate Description. 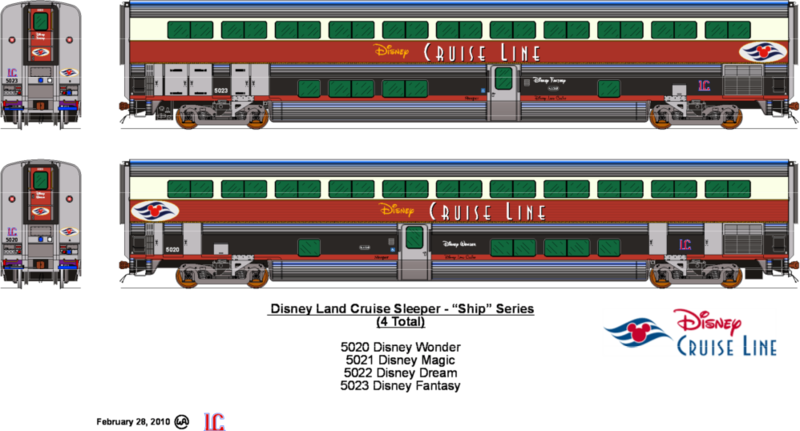 Special sleeping and dining cars tacked on the end of the regularly scheduled Southern Continental, providing ammenities found only in Disney's Premium Hotels or on thier seagoing Cruise Ships. Disney does not know about this, though if/when they find out, hopefully they'll let me keep them online. Prints from this page are NOT available from Silver Rails Gallery. I ask nothing for posted drawings to be displayed on personal sites, as long as permission is granted from the owner (me or another posted artist) and credit is given. powered by website analytics and statistics program.